The Pan American Health Organization said an adequate supply of medicine was steadily streaming in, but distributing those supplies "remains a complex logistic operation, sometimes made worse by an unstable security situation." The Haitian government is estimating there will be at least 400,000 cholera cases in the first 12 months of the epidemic, a period ending next October -- with half of those cases occurring by mid-January. Cholera has spread to all of Haiti's 10 departments or provinces. Of the total cholera cases reported, 83,166 patients have been hospitalized, the Health Ministry said. The overall fatality rate was 2.2%, but is considerably higher in some rural areas. 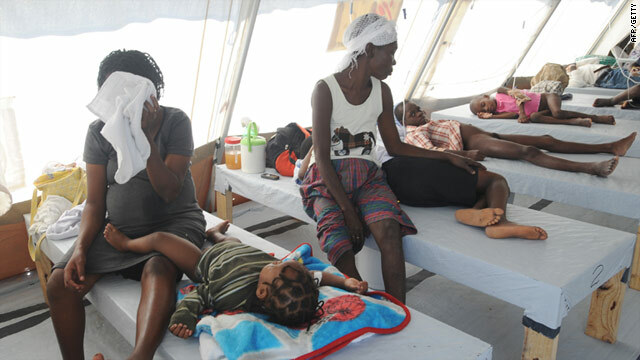 More than 12,000 aid agencies operate in the impoverished Caribbean nation and this week, the president of the international council for Medecins Sans Frontieres (MSF or Doctors Without Borders) called the cholera epidemic response inadequate. "The country is small and accessible and, following last January's earthquake, it hosts one of the largest and best-funded international aid deployments in the world," wrote Unni Karunakara in an opinion piece distributed to journalists. Haiti, then, should be an unlikely place for the relief system's failure, but he questioned why the death toll has been so high. Sylvain Groulx, head of Haiti's MSF mission, said many Haitians are forced to either buy bottled water or fetch it from bore wells, which can be contaminated with the cholera bacteria. Karunakara said he visited Port-au-Prince lately and found that nearly a year after the devastating earthquake, little has been done to improve sanitation, "allowing cholera to spread at a dizzying pace." "We began chlorinating the water ourselves. There is still just one operational waste management site in Port-au-Prince, a city of 3 million people," he said. Even before the quake, only 12% of the Haitian population of 9.8 million received treated tap water, and only 17% had access to adequate sanitation, according to the U.S. Centers for Disease Control and Prevention. On top of that, Haitians were unsure how to respond to the disease when it first surfaced in October -- there had not been a cholera outbreak in Haiti for decades. In the first weeks, hospitalized people in Artibonite province, the heart of the outbreak, said in interviews that two-thirds of them had been drinking untreated water from rivers or canals and did not routinely use chlorine to sanitize drinking water. Nearly four out of five defecated in the open. Symptoms of cholera, an acute, bacterial illness caused by drinking tainted water, range from mild or even nonexistent to profuse diarrhea and vomiting. It's not difficult to deal with the disease but if left untreated, death from dehydration can come within a matter of hours. Post-election unrest in early December hampered prompt cholera response because of blocked roads, traffic disruptions, insecurity and fuel shortages. There is no way to quantify the toll exacted by the instability, Groulx said, but it had an impact. He said, however, that MSF was seeing fewer sick people coming into cholera treatment centers. That doesn't mean the epidemic is close to being over, he said, but it's a "little ray of hope."